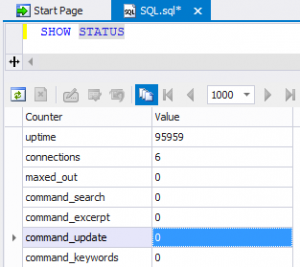 At the moment, dbForge Studio for MySQL allows you to create a connection to Sphinx Search Engine. Due to technical restrictions, a warning message appears in some cases. The reason the message appears is because, there is no possibility to define that the connection happens to Sphinx SE. We requested the Sphinx SE developers team to fix this problem. When the warning message appears? Case 1: When you create a connection to Sphinx Search Engine, the message appears for the first time. Case 2: The same message appears when you create a new SQL document. It appears only once and doesn’t repeat for other new SQL documents. Case 3: The message appears when you click a Sphinx SE connection in Database Explorer. In any of these cases, just click OK, and continue your work. Despite this warning, you can write and execute different SphinxQL queries. As for the test we can execute a simple command that will show us Sphinx SE usage statistics. dbForge team hopes that the Sphinx SE developers fix this issue shortly. This will allow us to fully support Sphinx SE.